Cyrus Pre XP d review | What Hi-Fi? We've been quite vocal in our admiration for Cyrus' integrated amps, so it's nice to put them to one side and investigate one of the company's pre/power options. This combination is of particular interest, because it marks our first meeting with Cyrus' Pre XP d pre-amplifier. The Pre XP d uses trickle-down technology from the company's high-end DAC XP and features its own USB input and internal DAC. 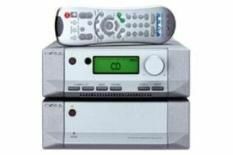 It's equipped with a wealth of sockets, including six line level inputs, two digital optical and two digital coaxial inputs, and it also caters for dual zone functionality. The 8 Power already has a five-star rating, having been used to great effect in other Cyrus set-ups. But although we've shifted our attention from Cyrus' integrated amplifiers, it's still impossible not to be blown away by the sonic quality on display. The jump in performance to this from the likes of the Cyrus 8 XP d is dramatic, and that's saying something. Subtleties of the 160BPM track such as the echo around the choir during the opening moments of the track are displayed with remarkable ease. As you listen to the breathtaking work of John Frusciante during Red Hot Chili Peppers' Don't Forget Me, you can hear the edge of every plucked string and note. The Cyrus duo really does leave no stone unturned and brings you a remarkable level of detail for the money. Switching between various tracks constantly introduces you to more nuances and fine details that you swear that you haven't heard before. The Cyrus pairing also displays that trademark speed and agility that we've come to expect from the company's electronics. Throughout Jay-Z's Empire State of Mind, low frequencies are stripped of any sonic fat, leaving you free to enjoy the precise, punchy and rhythmic flow of the track. But the appeal of the Cyrus pairing doesn't end here. Added appeal comes from the ability to upgrade the set-up over time. For example, you can add a PSX-R power supply to both the Pre XP d and 8 Power. You could even add another 8 Power to the system and run them in mono or stereo form. Whichever way you run it, the Cyrus Pre XP d makes a perfect partner for the 8 Power amp.